High-load scalable OCDS-compatible e-procurement solution with API, e-Auction module, and Document storage. Open Procurement initiative consists of a series of interrelated legal, institutional and organizational measures aimed at making the most rapid transfer of state services to electronic procedures, the introduction of paperless workflow, providing the public with direct and unrestricted access to information. One of the most important steps is to create a 100% transparent e-Procurement system. Electronic public procurement system is the software that uses web-based information/communication/networking systems to carry out several or all stages of the procurement process. It has to be open to all qualified and interested bidders, be appropriately advertised, have objective qualifications criteria, and be awarded to the least-cost provider without contract negotiations. Simplicity and ease of use. Procedures related to procurement should be simple and clear for all participants, especially organizers (procuring entities) and participants (bidders). ‘Openness’ of documents and transparency of procedures. The public should have free access to all documents related to public procurement. Equal opportunities for participants. All companies can participate if their proposal meets all the tender requirements. Prevention of corruption. Use of electronic documents, strict qualification requirements, transparent system of proposals evaluation and awarding will assist with rooting corruption out. Functionality. The system covers all stages of the procurement: preparation and initiation of procurement, auction or reduction, assessment and awarding, review and complaint resolution. Interface. An API component integrates procurement database with many third-party trading platforms and allows access to Tender database. Accessibility and integration of e-procurement in the broader system of e-governance, companies register, systems of analysis, etc. Preparation includes user registration, creating/editing of user or organization credentials (performed on web platforms). Procurement Initiation. The procuring entity declares "Tender", the participants read the requirements and have opportunity to ask questions to the procuring entity. Auction. Participants register as bidders in the auction. When the auction ends, system automatically ranks bidders according to their bids. Qualification. Candidate’s proposal is reviewed and qualification is checked. The procuring entity, bidders, observer can view candidate’s proposal and ask for qualification documents. Completion. If during the Qualification stage a winner was chosen, the procuring entity registers the decision in the system, prints the extract (protocol) from the system about the held auction and its results, publishes the delivery contract in the system. The OpenProcurement toolkit includes two backend components: a Central database (CDB) and an API, as well as an Auction module. 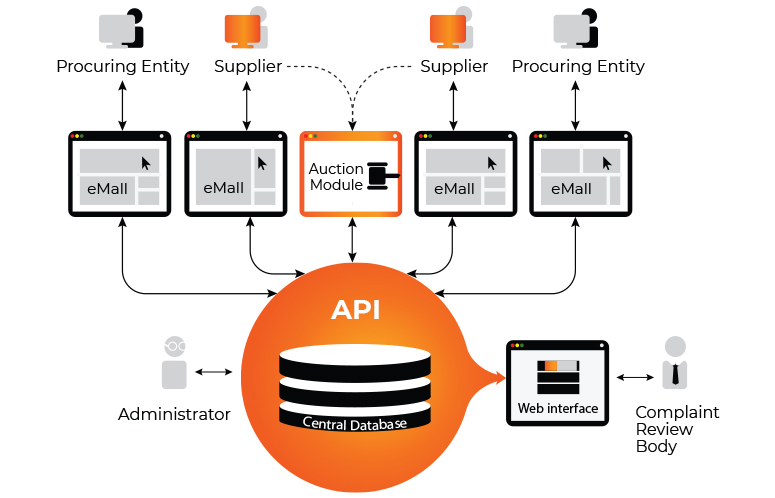 Third-party web platforms (web platforms that implement e-Procurement system features and provide access for procuring entities, suppliers and regular visitors) interact with the CDB via OpenProcurement API and provide suppliers with temporary credentials to access the Auction module for participation in the auction. The Administrator has direct access to the CDB and services provided by the backend; helps to maintain the system and connect web platforms to it. The Complaint Review Body accesses the system via specialized web-interface to review and resolve complaints. Interactions of web platforms and CDB are performed through the API - web interface based on the JSON notation. Business logic is implemented in Python. Non-relational database CouchDB was used to store records of auctions, bids, etc. Attachments (binary files such as pdf, xls, etc.) are stored on the Amazon S3-compatible file server. 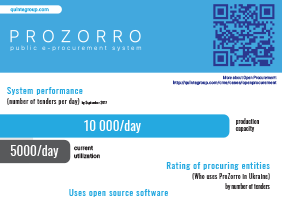 Originally OpenProcurement had been developed for ProZorro procurement system. But this toolkit is flexible enough to handle all shapes and sizes of government and private sector procurements with minimum changes. 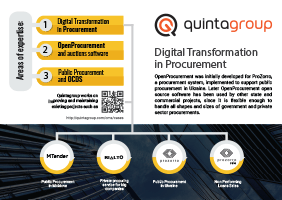 Quintagroup has the biggest expertise with this software, so it is easy for us to clone and customize OpenProcurement for other projects. 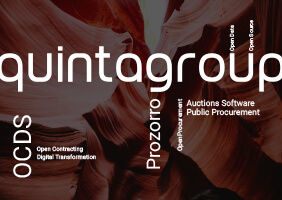 Quintagroup has developed and implemented e-Procurement solution that was used by the Ukrainian electronic public procurement system - Prozorro. Prozorro provides cross-access to the system. Users can see all procurements via their web platforms and suppliers can register their bid proposals to any procurement regardless of where the proposal was first announced. Competition between web platforms will lead to the procurement service improvement. Fourteen e-Malls are already providing access to the system. What is more important, the project is open, so any web platform can join if it provides the necessary functionality. Prozorro.sale is a Deposit Guarantee Fund (DGF) system that organizes sale of the property (assets), belonging to insolvent or liquidated banks. In order to ensure transparent, effective and fair sale procedures DGF decided to apply the same software that already proved to be effective in the Prozorro system. OpenProcurement toolkit has been used because it ensured simple and quick implementation. The Prozorro.sale’s architecture and main components are similar to those in the original Prozorro project. Hybrid system architecture with Central database (CDB) and electronic platforms connected to it proved to be efficient, since it provides equal access to the assets for all potential purchasers and bidders. High performance indicators of the Prozorro project's model and a substantial interest of the business sector in a similar system for commercial tenders resulted in Rialto, "the commercial ProZorro". In its core this project shares the principles of the ProZorro public e-procurement system - everybody plays by the same rules, a winner is selected transparently, and a fair competition is encouraged. The key components are as those in the original ProZorro: the central unit, which includes a central database (CDB), an API and several commercial platforms to provide or exchange information with a range of stakeholders. The OpenProcurement toolkit distributed under the Apache license can be used for both public procurements and commercial solutions. Yes, free OpenProcurement software can be used for development of custom commercial solution and even its sale. Parts of the OpenProcurement toolkit (e.g. Central database or Auction module) can be used together or separately for a variety of projects.